Automotive Surface Refinishing and Refinement. Surface is wiped down with isopropal alcohol to remove claying lubricate, waxes and sealants to exposed bare paint. Rubber trim, emblems, vents etc are masked off to prevent damage and debris from polishing. Paintwork is corrected through one of our level of correction service. We apply a silica(Si02) paint sealant lasting up to 4-6 months. Wheels wiped and protected with a Silica sealant. Tires protected with a water-based, none sling solution. This is for those who are looking to restore gloss and remove light swirl marks and hazing. This service is a good entry level correction over the entire paintwork. After the correction process is carried out we apply a Silica(Si02) sealant that will last 4-6 months depending on storage, mileage driven and weather. One of our most popular correction service. 2 steps of correcting to remove heavier defects that our level 1 service can't remove. Recommended for vehicles with moderate swirl marks, light wash scratches, micro marring, holograms and light water etching. After the correction process is carried out we apply a wax or sealant that will last 4-6 months depending on storage, mileage driven and weather. This service is for neglected vehicles. 2 - 3 stages of correction and spot wet sanding to remove all severe swirl marks, light to medium scratches, holograms and buffer trails and light water etching. In the end, you will be left with a perfectly scratch free finish with deep brilliant gloss. After the correction process is carried out, we recommend adding our CQuartz coating to lock in the results. This will also provide a harder layer of protection over the factory clear coat for scratch resistance and easier washing. If you’re looking for the ultimate paint correction we have to offer, this is it! This service includes up to 7 stages of paintwork correction including wet sanding (color sanding) to remove the texture in your vehicles paint, also known as "orange peel". After the correction process is carried out, we recommend adding our CQuartz coating to lock in the results. This will also provide a harder layer of protection over the factory clear coat for scratch resistance and easier washing. Paint correction is a process that removes a safe amount of clear coat or paint through mechanical abrasion using various types of machine polishers. 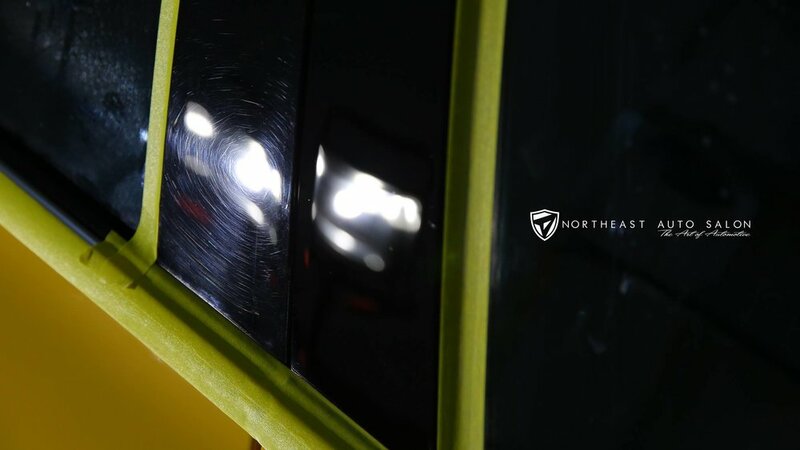 In most cases, scratches, swirl marks, buffer marks, micro-marring, cob webbing and hologram effects can be totally removed from all types of paintwork, including scratch-resistant ceramic clear coats. We do not use any fillers or glazes in our paint correction services. All imperfections are permanently removed safely.